Over 80% of renters have a desire to own a home, according to a 2015 survey from the National Association of Realtors. One big hurdle for many renters who are hoping to buy a home and take on a mortgage is saving for a down payment. In some cities, the average home is worth so much more than the average income it can take over a decade of saving to have enough for a down payment. Below we rank the cities where the average workers need to save the longest to afford a down payment. In order to rank the cities where it takes the most years of work to save for a down payment, SmartAsset looked at data for the 50 largest cities in the country. Specifically we estimated how many years it would take to afford a 20% down payment on the median home in each city if workers earning the median income saved 20% of their salary a year. Check out our data and methodology below to see where we got our data and how we put it together. 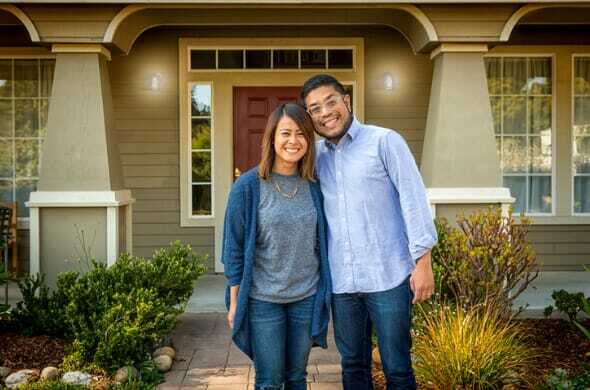 California homebuyers have it toughest – Four of the top five and six of the top 10 places where the average household would need to save the longest to afford a down payment are in California. Los Angeles leads the way, while San Francisco, Oakland and Long Beach rank second, fourth and fifth, respectively. Less planning needed in Texas – According to our data, residents in some Texas cities can afford a down payment after only a few years of saving. In cities like Fort Worth, San Antonio, Arlington and El Paso, the average household would need to save for less than three years to afford a down payment on the average home. Los Angeles ranks first. Using median income and median home value data, we estimate the average Los Angeles household would need to save for almost 11 years to afford a down payment. That is a year longer than San Francisco, the second-place city. However, even if the median household in Los Angeles did save up for a down payment, they still may not be able to afford the median home. Our mortgage calculator recommends a minimum income of $92,098 in order to afford a mortgage of $474,800 at a 4% mortgage rate over 30 years. The median household income in L.A. is only $54,432. Housing costs are astronomical in San Francisco. According Census Bureau data, the median rental in San Francisco costs nearly $1,800 per month and owning a home is no different. In order to simply save up for a down payment on the average home, we estimate the average San Francisco household would need to spend nearly 10 years saving 20% of their income. The median household income in SF is the highest in our data set at $103,801. Despite earning around half as much as households in San Francisco, New York households need to save just as long to afford a down payment on the average home. Taking a median home value of $569,700 and a median household income of $58,856, we estimate it would take just under 9.7 years’ worth of saving for the average New York household to save enough for a down payment on the average home. Of course, there are a wide range of home values depending on where you look in New York. The median home in Manhattan for example is worth over $1 million, while the median home in the Bronx is worth just under $400,000. Census Bureau data shows the median home in Oakland is worth nearly $650,000. That means to save for a down payment the average Oakland household would need to save 20% of their income for 9.5 years to afford a 20% down payment on the average home. Even for the average household in San Francisco, who earn nearly 50% more than their Oakland neighbors, saving up for a down payment on the average Oakland home would take over six years. Another California city wraps up our top five. Median households in Long Beach earn over $60,000 per year, which is above the national median. However, the median home in Long Beach is valued at nearly $519,000. If the median household in Long Beach was saving for a down payment on that home, they would need to save for 8.6 years before having enough. Miami has the lowest median home value in our top 10. Census Bureau data shows the median home in Miami is worth just under $278,000, about $70,000 more than the national median. However the average household in Miami only earns $34,900 per year making these homes relatively expensive. We estimate that by saving 20% of their annual income, the average Miami household would have enough saved up for a down payment after roughly eight years. The median home in San Diego is worth about the amount as the median home in New York. The reason San Diego ranks below New York (or above depending on how you look at it) is that San Diego households take home much larger paychecks than households in New York, on average. The median household income in San Diego is 21% higher than it is in New York. This means it would take the average San Diego household only 7.9 years to save up for a down payment on the median home compared to New York’s 9.7 years. San Jose households have the second-highest median income in this study. According to Census Bureau estimates, the median household in San Jose earns nearly $102,000 per year. But that high income is no short cut to homeownership. Our data shows that the median home in San Jose is worth $802,000. To afford a down payment then we estimate the average household in San Jose would need to save 20% of their income for almost 7.9 years. 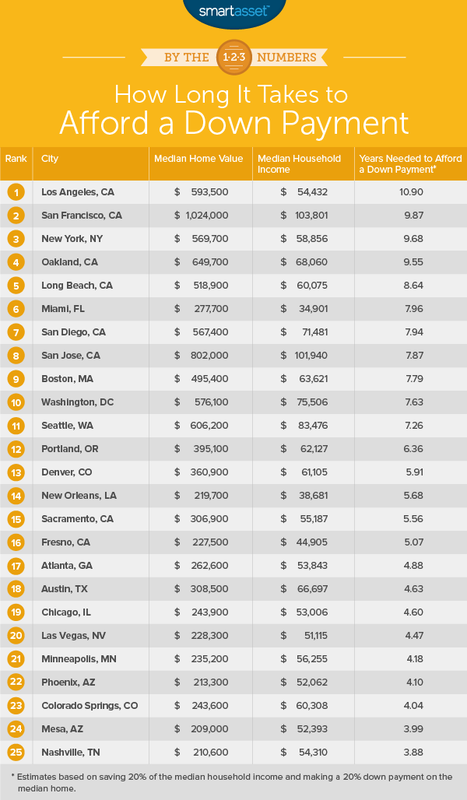 Judging by other cities in our top 10 you could argue the median home in Boston is somewhat affordable. Across our top 10, Boston has the second-lowest median home value. However Boston only has the sixth-highest median income, making homes pricey for the average resident. We estimate that it would take about 7.8 years’ worth of saving for the median household in Boston to have enough for a down payment on the median home. Our list ends in the nation’s capital. The median home here is worth $576,100 and a 20% down payment on that home is equal to $115,200. We estimate that by saving 20% of their income per year, the average household in Washington, D.C. would save around $15,100 per year. That means a down payment on the average home would take 7.6 years of saving. Data for both metrics comes from the Census Bureau’s 1-year American Community Survey. First, we found the annual savings for households by assuming they saved 20% of their annual income. Then we estimated the cost of a down payment. We assumed a household would save for 20% of the median home value. To complete our analysis, we divided the estimated down payment by the annual estimated savings. This gave us the estimated years of saving needed to afford a down payment. Using this number, we ranked the cities from most years of savings needed to least years. Know how much you can afford – While you should probably start saving for your down payment long before you are buying your home, it is a good idea to know how much home you can afford. 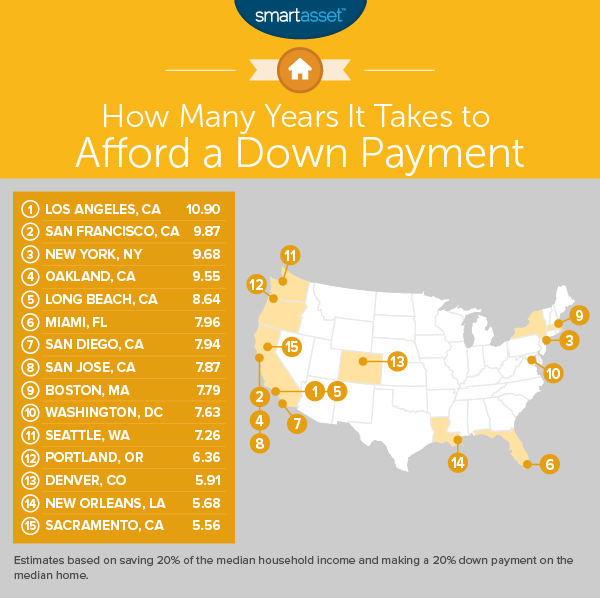 This will then give you an idea of how much to save for your down payment. Get assistance – While most experts recommend saving up for a down payment of 20% of the home value, there are other options for people who are struggling to save. For example, the Federal Housing Administration backs loans for certain applicants. If you meet their requirements you can get a home loan while only putting 3.5% down.